Before I started this book, I'd never read anything on the blog, The Art of Simple. But somewhere between the prologue and the epilogue, I became addicted to it. That's because Tsh Oxenreider won me over almost immediately, and I was eager, even while still in the midst of this book, to read more of her words. And now that I've finished? Well, I wish she posted multiple times a day. It's funny because even though Tsh and I are different in a lot of ways (you're not going to see me packing up my family for an entire year in order to go gallivanting around the world), something about her life goals resonated deep within me. Yes, I thought over and over and over again. Yes. Once again I realized that people don't have to live identical lives or have identical interests in order to connect over an identical purpose. And the purpose is this: take the important components of your life (for Tsh, those areas were food, work, education, travel, and entertainment) and make them meaningful. Be intentional with your time and effort, and give those pieces the attention they deserve. The book is part self-help and part memoir and feels somewhat similar to The Happiness Project. In other words, it's exactly the kind of book I love. Favorite Quote: "I've decided that the aim for my family is 80/20. If 80 percent of my family's food consumption involves whole, seasonal food made with care, then we're doing all right. The 20 percent is the sprinkles on top of the ice cream. Literally." Why it resonated with me: I am not good about making myself (or my family) eat healthy foods . . . but I want to be. And this is exactly the kind of balance that, in a perfect world where I plan ahead and don't grab three bags of Goldfish as we rush out the door, I would go for. Reading this section actually inspired me to try out our local food co-op, and even though it was a disappointing first week (just not the variety or out-of-the-ordinary produce I was hoping for), I have high hopes for the future. Favorite Quote: " . . . my ability to do something and my available time to achieve it don't oblige me to say yes." Why it resonated with me: Because I'm a stay-at-home mom, my time is fairly flexible. I also belong to a church that emphasizes the value of service. Consequently, I often run into the problem of saying yes to everything that comes my way. I'm not saying it's not worth it to make the sacrifice and help others (I have certainly been blessed on countless occasions for doing the inconvenient thing), but it's not always the best (or even the most selfless) choice. I feel like I need to make the above quote my mantra and post it in strategic places so that when I'm on the phone with someone and they're asking me to do something, I can remember that "my ability to do something and my available time to achieve it don't oblige me to say yes." Favorite Quote: ". . . it was important to be intentional with our family's decisions--because no one but us could decide what was best for our family. Even if it meant us sitting squarely in the middle of both camps, where we were a traditional schooling family who loved homeschool, or a homeschooling family totally open to using our local schools . . . We'd just evaluate the best educational route for each of our kids each year, not assuming any path was best simply because it was easiest." Why it resonated with me: It's probably fairly obvious from some of the books I read and some of the posts I write that I am passionate about education. I don't believe in boxing myself into only one option or in putting all my eggs entirely in one basket. I research, I evaluate, I decide, and then I do it all over again. It's an ongoing process, and I don't expect or intend to ever be finished with it. Favorite Quote: "As much as our family loves passport stamps, we can find the same answers to our questions about life . . . without leaving our motherland . . . It doesn't require a lot of gas in our car or a backpack stuffed with plane tickets. But it does require bravery, and a willingness to let your kids leap onto slippery stones and investigate life up close, with dirty fingernails." Why it resonated with me: Mike and I are not terribly ambitious when it comes to traveling (although we do have a big trip coming up in a couple of months that I'm excited to tell you about soon). However, all of my experiences with traveling, whether it be near or far for short or long, have been overwhelmingly positive. I think it's wonderful to see new parts of the country or the world, but I also know there are hundreds (yes, hundreds) of new things we could do within a four-hour radius of our home. That's why we went to the aquarium and Saturday's Waffle and the mountains this summer. Each new experience (even the really small ones) enriched our lives, expanded our vision, and brought us closer together as a family. Favorite Quote: "I wanted us to make daily choices with hearts that were sensitive to the real world, not with spirits that demanded another show, another episode of pretend people living pretend lives. One small way for us to cultivate that sensitivity was to cut back on TV." Why it resonated with me: Did you know I watch almost no TV (unless, of course, the Olympics are going on)? If you ask me about a popular show, don't be surprised if I've never even heard of it. I'd like to say it's because I never waste time, but that's not true. No, I have a bunch of other ways I relax and unwind. I actually just don't like TV, it's as simple as that. But reading this section made me realize that whether or not I'm spending my free time with TV or blogs or books, I can be more intentional about what I do to be entertained. Tsh didn't have a section for religion or spirituality, which I thought was interesting until I realized it was sprinkled through all the other sections. That is exactly as it should be. In my own life, my faith is embedded in all other aspects of my life, influencing my choices and aiding my actions. 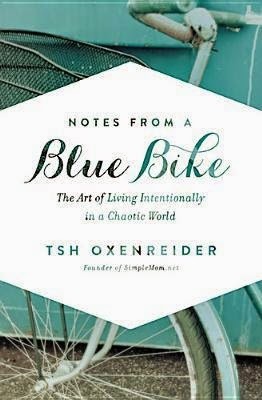 If I had to think up one complaint with the book, it would just be the title--all of the references to her blue bike felt contrived and forced to me. But other than that, I loved it. I intend on buying my own copy since I can tell it's going to be a book I will continue to think about and reread. This sounds right up my alley. I'm so adding it to my TBR. Wow, this sounds phenomenal. I hadn't heard of the blog before, either (thanks for the link to it!). I love that part-memoir feel to books like this, too.